Aside from wine, books are my favorite thing to give as gifts. 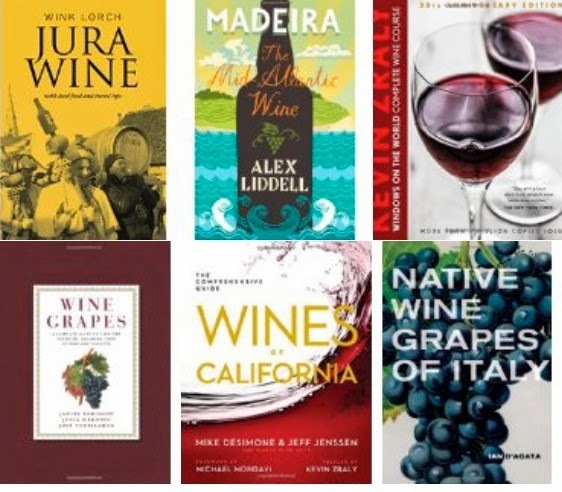 Here are my top picks for a wine centric book giving. I wrote this post a few weeks ago, before Eric Asimov’s book suggestions appeared, but glad to see we have some selections in common. Note: I purchased all of the books below myself except where noted. I was a Kickstarter sponsor for this book last year and its format as a hybrid travel guide and definitive wine resource is exactly the type of book wine travelers need. I’ve never visited the Jura, but this book has moved it to the top of my wine travel list. My home state has a lot to cover, but Mike DeSimone and Jeff Jenssen manage to give every region its due in this comprehensive ode to Calilfornia Wine. Windows on the World in Wine was one of the first books I purchased when I became interested in learning more about wine. The 30th Anniversary Edition offers the same approach to learning about wine in a new accessible design and layout with updated vintage notes, maps, and charts. Note: I received the new edition of the book as a review copy. This definitive tome came out in 2012. It’s pricey but worth it and makes a great gift for someone special you want to splurge on. WISH LIST -- What I’m asking Santa for this year. Italian wines have always held a special place in my heart and on my palate. My deep interest in wine really began after I lived and worked in Italy and I think this book looks like a great way to fall in love with Italian wine all over again. I’ve always been intrigued by Madeira, that tiny spec of an island out in the Atlantic. I’d like to plan a trip and to hike around the island on the levada trails by day and sip Madeira by night. Why all the fuss about Thanksgiving wines every year? Well, I think it all comes down to fear and perfection. People have wildly high expectations and this leads to fear that their choice of wine will not be perfect. Here is my annual Thanksgiving advice: Relax! Perfect is not all it’s cracked up to be. Choose wines you like and let the day unfold. Odds are, unless your family and guests are extremely wine centric, no one will be talking about the wine served. Just have plenty of it, whatever it is, and everything will be just fine. Wine is Travel in a Bottle -- so this Thanksgiving I offer you six selections from a few of the places, near and far, I visited this year. Aged for 48 months, this blend of Macabeu, Chardonnay, and Parellada is dry and elegant, well suited to appetizers such as crab cakes or blini with caviar or smoked salmon. Turkey or Tofurkey? Törley is the answer. This wine is Thanksgiving in a bottle! Dry and balanced with a hit of tart cranberry and pomegranate flavor that floats across the palate in a parade of tiny bubbles. A light, bright, delight -- I had this Pinot Gris for the first time at a restaurant outside of Vancouver and could not stop craving it. I finally had to go back to B.C in person to get some, and I’m glad I did. It’s luscious lychee, peachy flavors, and zesty acidity could pair well with anything from oysters to sweet potatoes. This is one of the most delicious Viogniers I’ve ever had--completely captivating with a fabulous apricot and floral bouquet, followed by peaches and cream on the palate with citrus and green apple notes. This would pair nicely with a mushroom risotto. Dark and griping with a flourish of full flavor, this would be excellent with duck or sausage stuffing, also good to drink alone outside as you count your blessings and hope no fights break out before dessert. This Cab Franc is one of my favorites-- bold, balanced and enough body for any dish your casserole crazy Aunt Emma brings, as well as a great accompaniment to turkey or squab and other birds you might have flying around the house. NOTE: I tasted all the above (except for the Törley) in their country of origin and encourage you to do the same. I also bought all the wines with my own wampum, and despite rumors to the contrary... I DO NOT work for Blue Danube Wine, I just really like and appreciate their offerings. 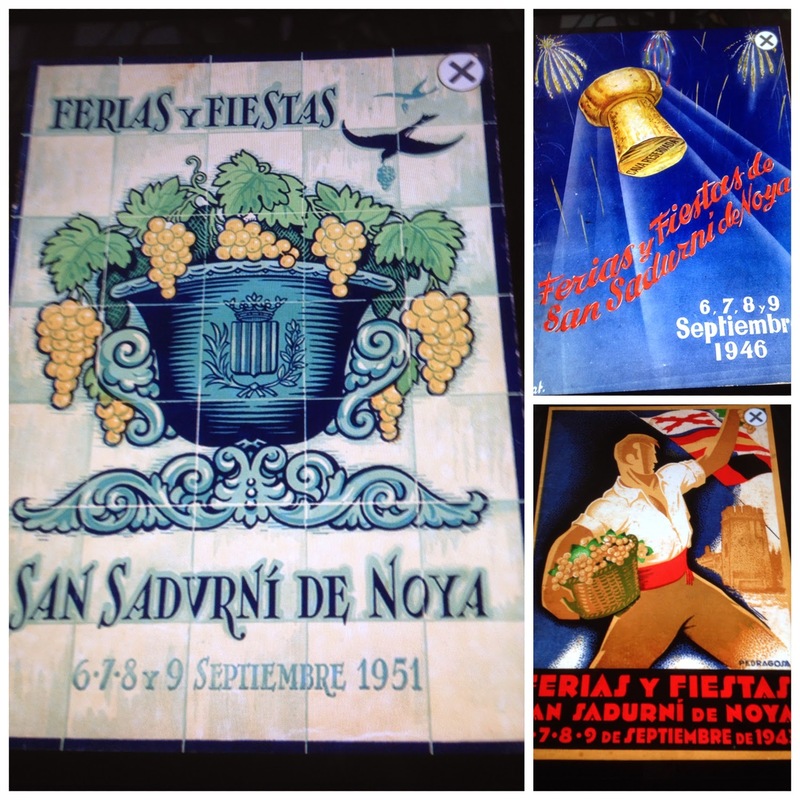 As I mentioned previously, here in this post, I was part of a hosted team that toured the Cava region of Spain last month for the 50 Great Cava’s Tour in the Penedès. Our first stop was at Adernats Vinícola de Nulles where we discovered the César Martinell designed wine cathedral--an homage to modernism with a hat tip to Antoni Gaudí. This is the place to taste Cava and ponder the elements of architecture and structure in wine. We walked the grounds around the vineyards and examined the rocky clay and limestone soil. The vineyards have little change in temperature from day to night, but a sea breeze gives respite from the heat, and allows for good acid and sugars to develop. Adernats is part of a co-op that was formed after the phylloxera devastation in the region. Adernats also produces other products within the co-op including a superb olive oil, honey, fruit jams and hazelnuts. Confession: I hate hazelnuts. I think Nutella tastes like poison. The smell of hazelnut flavored coffee makes me recoil. In short; I've never met a hazelnut I liked. But my abhorrence of hazelnuts came to an end at Adernats. Cava and hazelnuts might just be the perfect pairing. Maybe I've just never had a good hazelnut before or all the previous ones were rancid, but the nuts at Adernats were a revelation. The slightly oily and full rich flavor of the toasted hazelnut was a sublime pairing with the crisp dry Cava. Perhaps the winery should be called Adernuts! All were a blend of Macabeo, Xarel•lo and Parellada grapes. 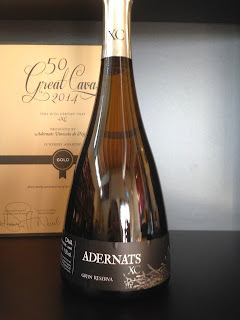 We also tasted one of the 50 Great Cavas -- The XC Gran Reserva Cava DO crafted from 100% Xarel•lo grapes and barrel fermented for five months, followed by 45 months of secondary fermentation in the bottle. This was my favorite Cava of them all. It had a lightness of being, yeasty with notes of spiced pears and apples and grounded with wonderful minerality. Our host looks a bit like Sergio Garcia here, no? As we popped nuts, sipped Cava and contemplated the architecture, I chatted with Ms. Lara Dunston of Grantourismo and noticed her pockets were stuffed with nuts. How they got there is anybody's guess. I suppose good hazelnuts are hard to come by in Cambodia. After the Cava tasting we were led up to the top of the winery for an outstanding dinner in the rafters above the tanks. Watermelon anchovy gazpacho? Yes, Please! Watermelon and anchovy may sound weird but I loved it. I love anchovies with everything so this was a special treat, there was also some olive oil and tomato in the gazpacho to round out the flavors. 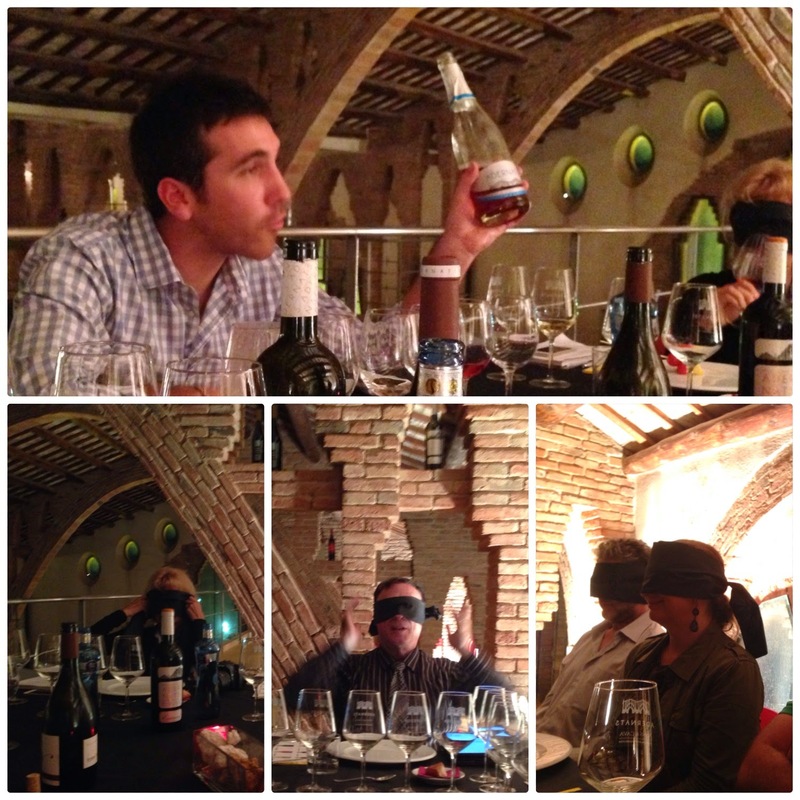 During the meal we donned blindfolds which added to the heightened sensory experience and gave the evening a slightly naughty Eyes Wide Shut tinge. While blindfolded we were given several food items on a wooden skewer including a cherry tomato, watermelon, and pineapple and asked to identify what they were. I must say trying to eat anything off a skewer while blindfolded is an accident waiting to happen. Fortunately the blindfold served as protection from getting poked in the eye. 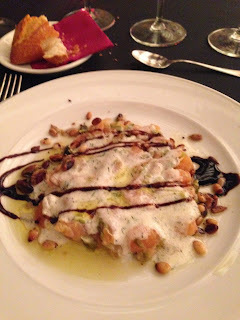 I’m not sure what the above dish was called but it was AMAZING - a mélange of flavors with pine nuts, salmon, cream, balsamic vinegar, and my new best friend, hazelnuts. The winery holds dinners once a month that are open to the public. If you are going to be in the area, contact the winery and make plans to attend. The inspiring surroundings, fine fare and excellent Cava's make for a notable evening. 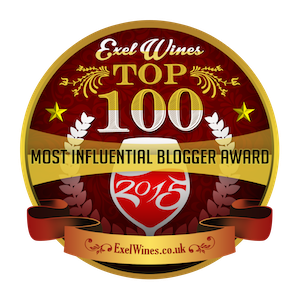 Last Week in Wine -- New series! I often tweet out what wine I’m drinking during the week and highlight various wines from my region as well as from regions around the world, but I don't always have room in a tweet to elaborate on each wine. 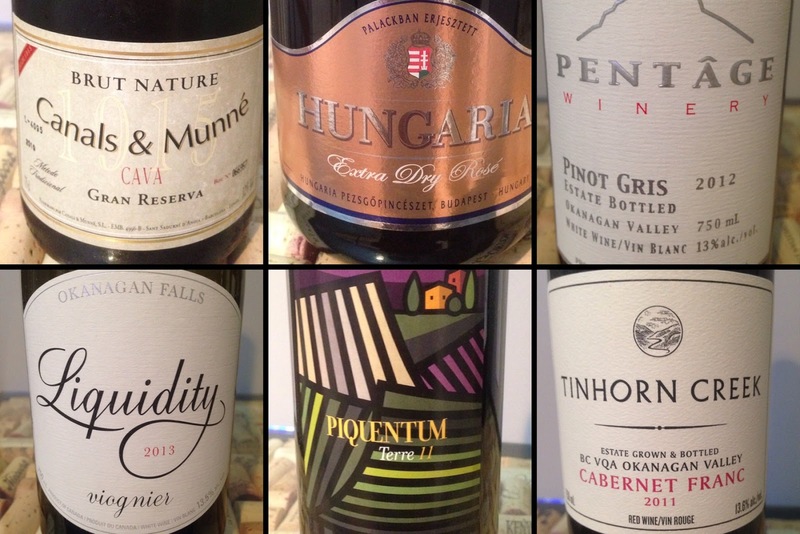 So I’ve decided to collect them in occasional posts called Last Week in Wine. Catchy title right? I got the idea from Last Week Tonight with John Oliver. I doubt I will post this every single week, but this will be an ongoing series, a round-up of the wines I tried and some brief notes on each. Unless noted all wines were purchased with legal tender by me. I first came upon this wine when I was living in Florida and cruising the local Total Wine aisles for some decent wine to take my mind off the fact I was living in Florida. Anyway this wine did the trick. I love Bonarda (aka Charbono in California) and this one is a great value and a true representation of how lovely Bonarda can be-- dark in color, light tannins and good acidity with a hint of mint, dark cherry and concentrated plum flavors. Brambly and delicious. I bought it at Bottle Barn in Santa Rosa for $7.99. Last week I had the chance to chat with Rob Barnett of Vin Village Radio about my blog, my recent travels to Spain and Latvia, and the upcoming season of writing retreats for Writing Between the Vines. I was just back from my trip to Spain, jet-lagged and fighting off a bad cold, so it's amazing I did not cough once during the entire interview, but I do sound rather congested! Below is the page from VinVillage Radio page with the link to the audio file as well. Marcy Gordon's background is in consumer marketing where she worked to launch and position several start-ups including Travelocity and OpenTable. That experience, and her love of travel and writing, led her to become a freelance travel writer, who is currently the Forbes Travel Guide Correspondent for Napa and Sonoma. 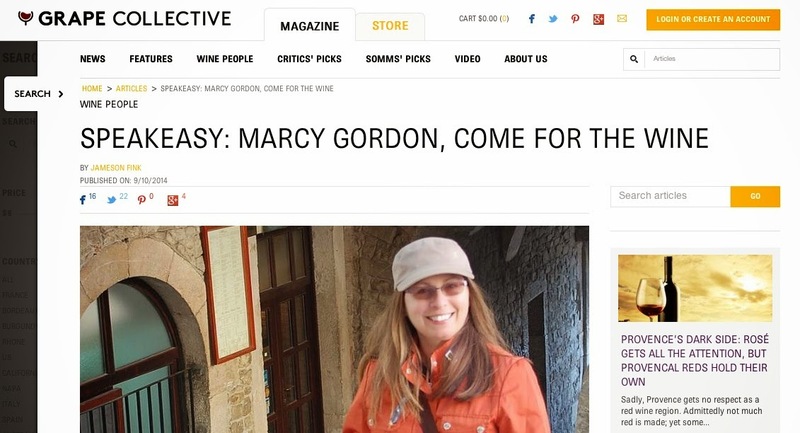 Along with her blog, "Come For The Wine" Marcy is also the Founder and Executive Director of "Writing Between the Vines" - Vineyard Retreats for Writers - A literary arts foundation providing residencies for writers on vineyard estates around the world. 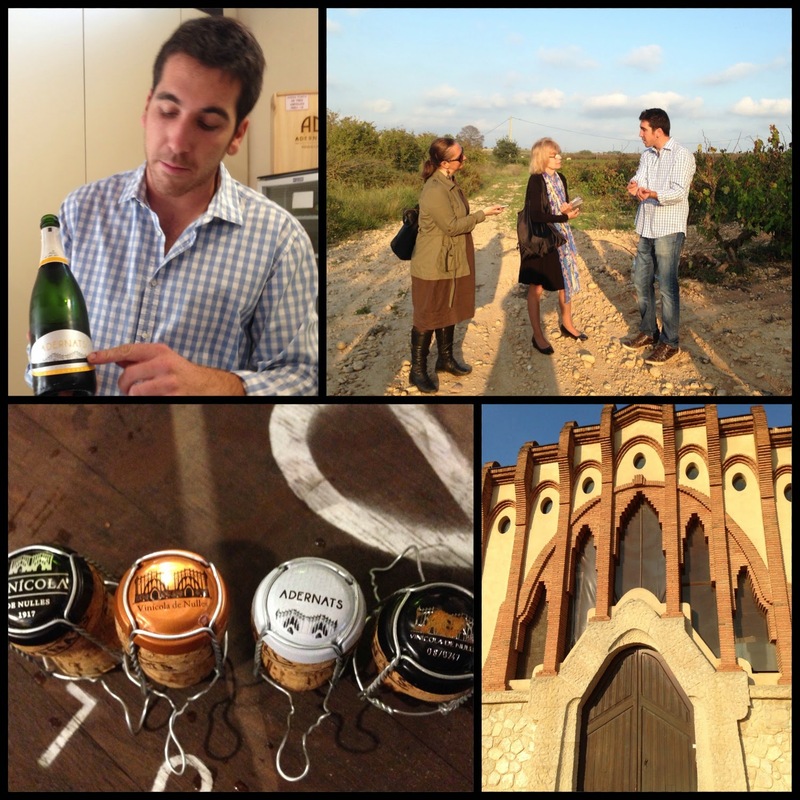 Next year, Canals & Munné will celebrate 100 years of Cava production. Recently I visited the cellars and tasted their award winning Cava’s as part of the sponsored 50 Great Cava's Tour. During our tour of the facility the charming Oscar Medina Canals demonstrated the manual corking equipment and showed us how the cage and cap was attached to the bottle. In the tasting room we tried several of the Cava's including an organic offering, Dionysus Brut Nature, and my personal favorite the Insuperable a blend of 40% Macabeau, 30% Xarel•lo, and 30% Perellada—a lovely balanced Cava with a floral nose, bright fruit flavors, and a bit of spice on the finish. 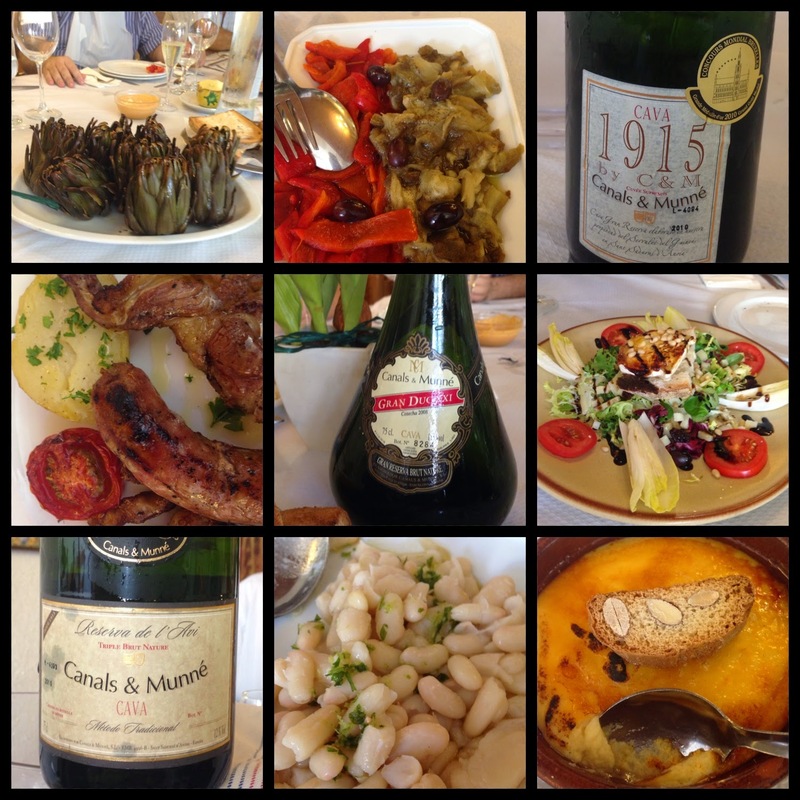 After the tasting we went to the Cava centric town of Sant Siduru d'Anoia to the original location of Canals & Munné, which is now a restaurant and there we commenced upon a long lunch and paired traditional foods of the region with several more wines. The highlight of the meal were the calçots --fresh green onions that are barbecued six minutes on each side, then the center shoot is pulled from the long green outer leaves, dipped in salsa de calçots and eaten by throwing your head back and dropping the onion into your mouth and hopefully not down your shirt. Fortunately plastic bibs were provided to keep everyone pristine. Export manager Natalia de la Calle Zancajo showed us how to prepare the traditional Catalan appetizer Pa amb tomàquet which consists of tomato, garlic and olive oil on fresh toasted bread. She cautioned us not fill up on too much before the main meal but it was hard to resist. In addition to the fabulous calçots, the lunch included plates of fresh salad greens, artichokes, white beans, roasted peppers and eggplant, lamb and sausage with potatoes and the signature dessert Creme Catalan. The wines served were the Canals & Munné 1915 blend of Pinot Noir, Chardonnay, Xarel*lo and Macabeu. Alos the Reserve de L’Avi, and the Gran Duc Cava in the distinctive flared bottom bottle. 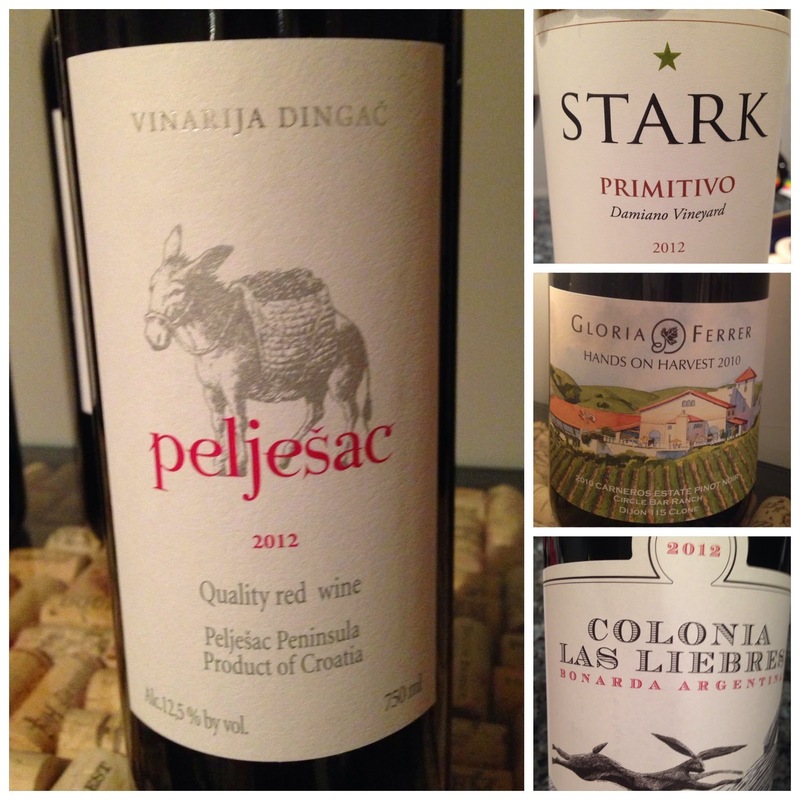 The Wines of Croatia Big Bibich Bash--Event Recap! I got called out, by a native Croatian, for serving sub-standard Ajvar but it was all in the spirit of goodwill and love for authenticity, at the First Annual Big Bibich Bash held on August 16, 2014. I'm going on record right now and calling it “First Annual” Bibich Bash, because drinking the wines of Croatia is something that needs to be done again and again. But back to the Ajvar for a moment—I had two types of Ajvar out in bowls and the minute Nenad Baračkov walked in and saw them he said—“I can tell without tasting, that orange looking one is Podkavak. Not the best!” He declared. We had only just met, so I was a bit taken back, but he was right. Nenad proved to be the most delightful guest and a fabulous source of information on the regional cuisine of Croatia. We discussed hobotnice (octopus), the best source for tinned sardines, the amazing cheese from Pag--Paški sir, and the origins of Supa, a red wine based soup with olive oil, sugar, and toasted bread. 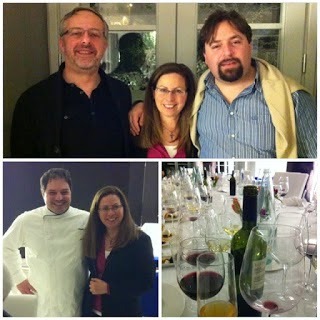 Many of the other guests were well versed in the Croatian food and wine scene too. I was lucky to host such a very convivial group. But the guest of honor was the Bibich—From the Sparkling Rosé, a festive dry delight --to the Sangreal Merlot, and the rich and dreamy Ambra. In a bit of a tasting reversal, we started with the reds first as the whites chilled. But I dare say with Bibich, tasting the wines a reverse order is not a problem. 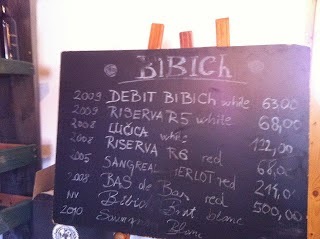 The Bibich reds are true shape-shifters, full of flavor and nuance. 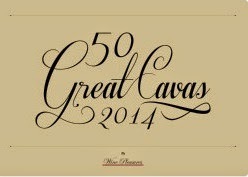 The Rhone style G6 Grenache was a standout as was the Sangreal Merlot and Sangreal Shiraz. One of my favorites the R6, a blend of 34% Babic, 33% Plavina and 33% Lasin; smells like a Zin, but drinks like a Pinot. Bas de Bas Rouge -- Dark, brooding, and beautiful, with elegance and structure--an embodiment of the land and place from which it hails. Overall, I find that a thread of salinity runs through all the wines and seems to be a characteristic of many Croatian varietals both red and white. As much as I love the reds it is the rare, unusual, and beguiling Bibich whites, the "Croatian White Unicorns” that I find most intriguing. My beloved Lučia—The original “white unicorn” that I first tried in Croatia. In a word; this wine is captivating. The mythical, magical creation of Mr. Alen Bibić. And a new unicorn --Bas de Bas Blanc. The Bas de Bas Blanc is multifaceted “orange” wine made from Debit grapes that spent 3 months on skins in stone vats, then 5 years in oak. At first it is comes across as herbaceous but not in a pyrazine green bean or bell pepper way-- but in a true herbal way. I got an immediate note of thyme, and a clean pleasing spicy tea tree oil scent that quickly opened into notes of apricot and honey and baked apple along with some lingering crushed herb notes such as parsley, sage, and rosemary—so along with thyme, it’s a veritable Simon and Garfunkel song. Debit -- I love 100% Debit in all it’s manifestations and this is one of the best. R5 -- Rich and unctuous blend of Debit, Posip, and Marastina, along with Pinot Grigio and Chardonnay; it’s a marvelous mouthful that is both refreshing and bold, and opens up to subtle corners of unexpected flavor. Trust me-- you just have to try this. Posip 9 - A classic Croatian white, fresh and vibrant-- this wine is enthusiasm in a glass. Great balance with a lick of salt, and a puff of chalk, it’s a gateway drug to the more complex whites. Except for the Posip, I think most of the white wines may show best if you start out chilled but let them warm up at bit, as I believe they reach their true expression when at room temperature. The whites also have the structure and body to pair well with hearty foods and it was universally agreed that they went particularly well with sausage hot off the grill. We had hashtags and tasting sheets and love notes to Alen-- but mostly we had a great time. Tremendous thanks as always to Frank Dietrich, for bringing the Bibich and sharing his knowledge and enthusiasm for the wines of Croatia and in particular the wines of Alen Bibić. Thanks too, for introducing me to so many new and interesting people--Nenad Baračkov and Roberta Wahl; Zdravko and Marion Podolski; Gisele Carig, and Candace. Though we'd never met before, I do believe we were all bonded by Bibich by the days end. Also thanks to James, Fred, Thea, and Liza (and her wine protégés) for coming out. If you are interested in tasting the Bibich line (and I heartily encourage you to do so) you can find them all at Blue Danube Wine. 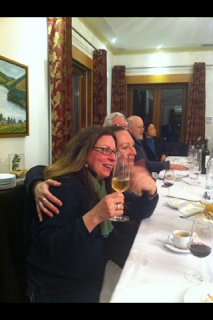 Three years ago this month, I held a Croatian wine tasting at my house with Frank Dietrich of Blue Danube wines, and it was the start of my love affair with Croatain wine and Croatia. See here, here, and here. This Saturday, August 16th, we are doing it again with the BIG BIBICh BASH--featuring the wines of Alen Bibić. I traveled to Croatia shortly after the 2011 tasting, and was supremely lucky to visit the Bibich winery in Skradin where I had one of the most phenomenal food and wine pairings of my life. The next day, some guy named Anthony Bourdain showed up for the same pairings and some extended drinking that was featured in an episode of No Reservations. But I like to say I was there first! 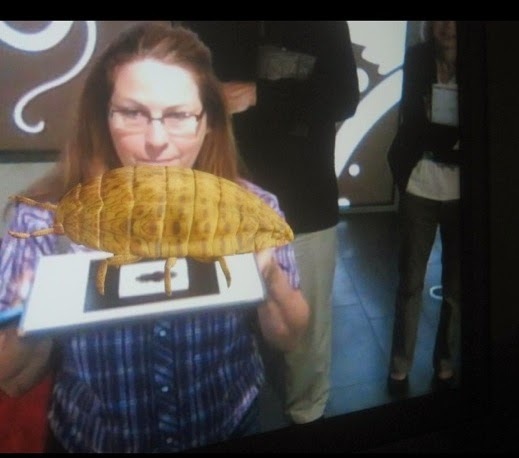 My post about the Bibich Dégustation has become one of the most viewed posts of all on my blog. Frank will guide us though twelve BIBICh wines including the Lucia, Bas De Bas, R6 and R5, as well as the new to me P9 Posip. 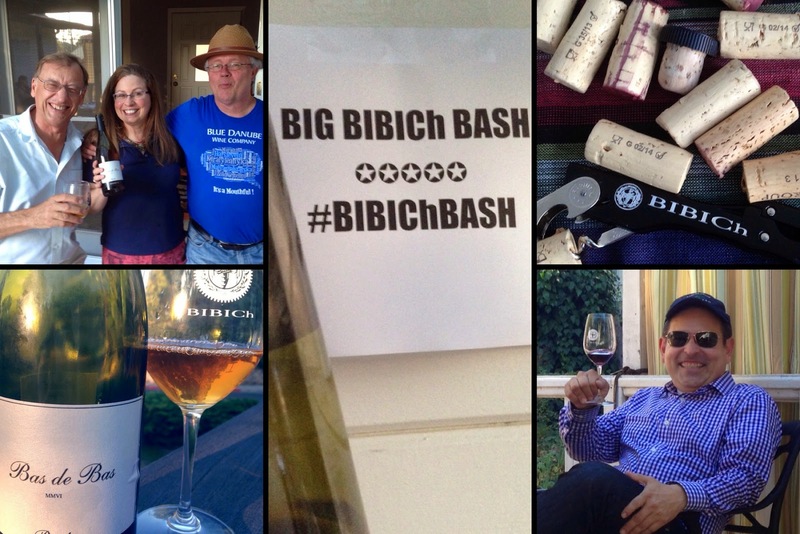 Follow the hashtag #BIBIChBASH for live tweets about each wine. I’ve raved so much about my favorite BIBICh wines, such as the Lučia and R5, they have become known as “Croatian White Unicorns” by some of my wine friends due to the adoration and mythical status I bestow upon them. But Unicorn is an apt descriptor for these rare, unusual and mythical whites. Here is a list of what will be poured at the BIG BIBICh BASH -- For more details, you can visit the Blue Danube site here. Okay, so no Teran above, but you can’t have everything! Over the last three years I’ve been back to Croatia several times, and experienced an astounding array of food and wine. It is truly one of the best emerging destinations for wine travelers. 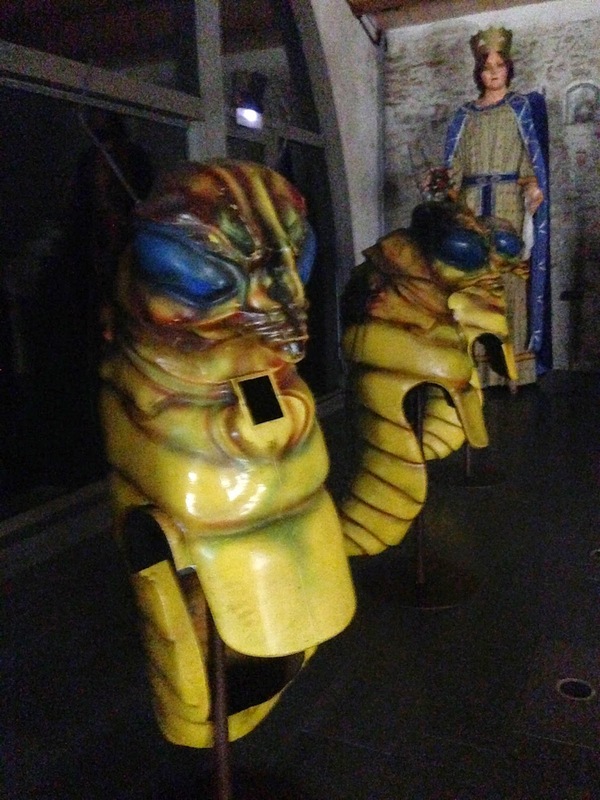 If you plan to visit Croatia I offer you the following tips here. 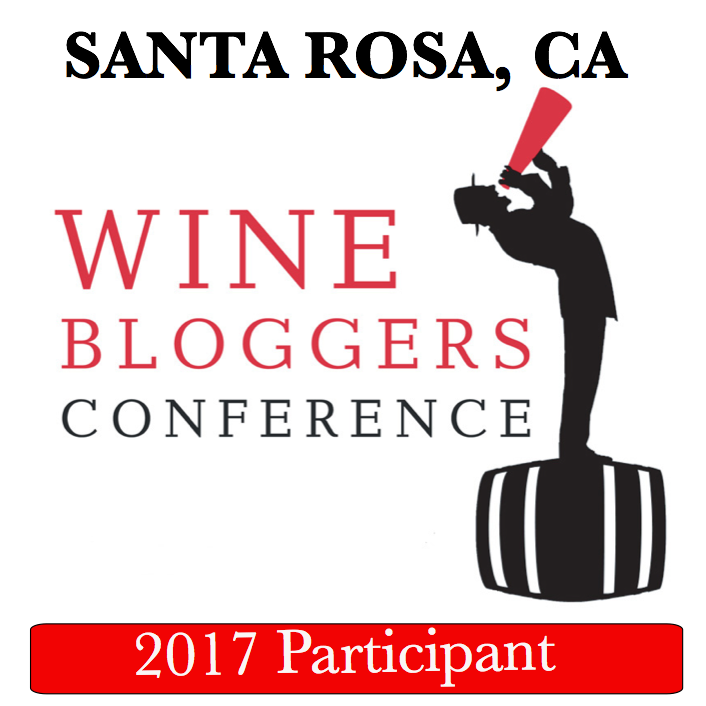 These are the wines I keep thinking about since I tasted them in Santa Barbara County during the July 2014 Wine Bloggers Conference. You’ll see three Chardonnays on this list, and while I am not an ABC’er by any means, I don’t usually buy that much Chardonnay outright. 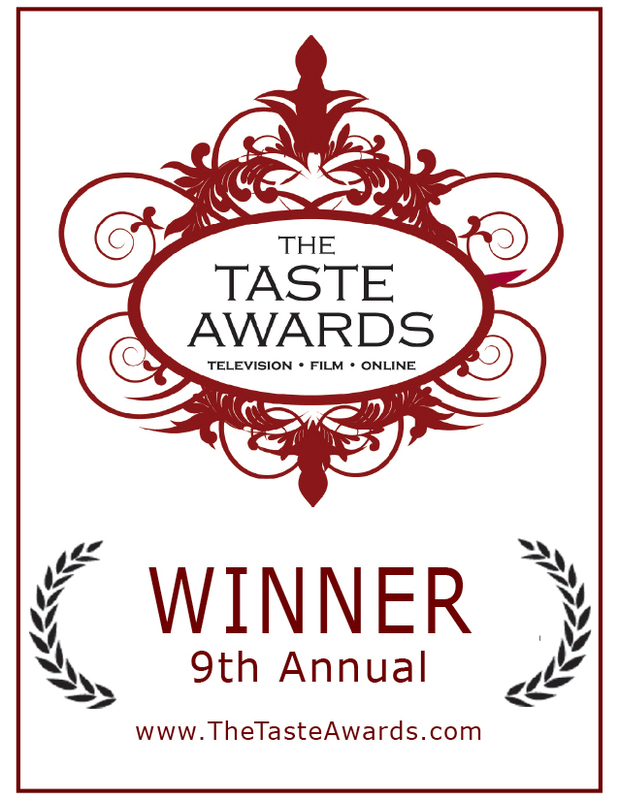 But that's changing, and I’m happy to find many new-to-me producers that have captured my attention and patronage. A word on tasting notes: I present my notes to highlight what I found in a particular wine, and my initial thoughts and experience while tasting. Consider this a nudge in the right direction to make your own discoveries. Below are some quick impressions I jotted down, wines are listed in no particular order of preference. One of the first wines I tasted upon arrival in Los Olivos. There is so much harmony and balance going on in this Roussanne. A delicate floral nose unfolds into a rich body of creamy spiced fruit and acidity. I bought a few bottles on the spot and then, having no restraint, immediately drank them when I got home. Now I’m pining for more. Captivating nose of cut grass, petrol, jasmine and gardenia floral notes. Bright with acidity and flavors of lemon, lime and orange with a bit of honeysuckle. Peachy-Lychee, creamy vanilla with a pleasant mid-weight on the palate and long rolling waves of flavor. I only got a quick sip at the speed tasting event, but it slowed down time around me. The bright, fresh hit of fruit and punch of acid made me want to grab the bottle and find a quiet place to enjoy it at a more leisurely pace. Ginger cookie on the nose with great spice and pineapple notes. Sea salt and sandstone minerality, like a luxurious day at the beach. Elegant and understated but with wonderful tension and energy. Wes Hagen’s “homage to Chablis” was a direct hit to my brains flavor center. Vigorous minerality tempered with a soft round mouth feel and light spicy floral notes of carnation. Good grief, the nose on this was jump-out-of-the-glass gorgeous. On the palate, a slight chalky note, but tons of white florals and tart apple flavor with great minerality and a light ocean breeze of salinity. Inox, a french term, means stainless steel. 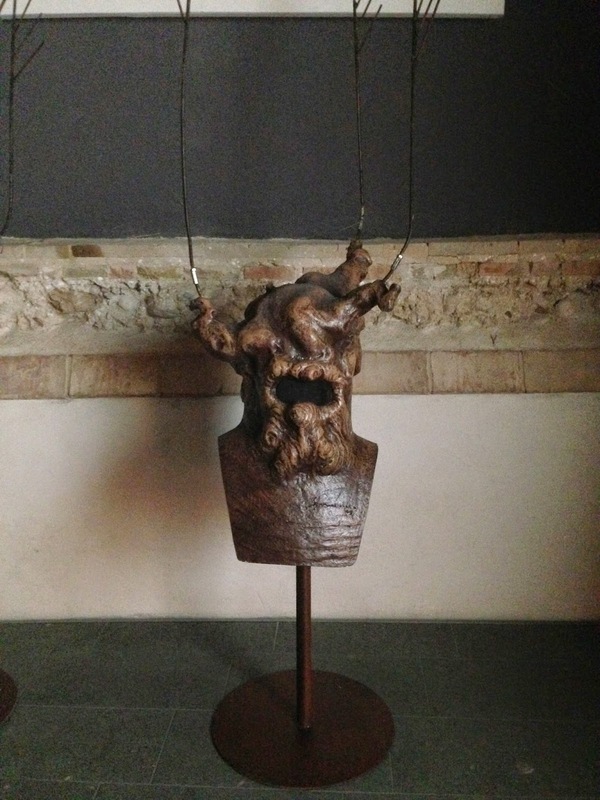 My first thought --where can I buy this? This Chardonnay had a brilliance from within, like entering a snowglobe of earth and light and bright fruit flavors all falling softly around me. It shook me up. “No dump” --my shorthand note meaning all of this beautiful juice is going down my throat not in the dump bucket. When tasting numerous wines in a day, “no dump” is a mark of high praise indeed. Deep cherry, loamy, dusty floral nose and marvelous mouth feel. This wine had a spring in it’s step and a song in it’s heart. I tweeted out this mini tasting note while I was at Presqu'ile: Whole cluster Pinot from @PresquileWine light and accessible but then reaches an unexpected depth. And indeed it did. The layers of flavor developed further with each sip. I tried this at the Authentic Press party Shawn Burgert hosted, and I wish I’d gotten more details, but it grabbed my attention at first taste. On the bus back to the hotel I scribbled the name down in my notebook with the words-- "Check out what's going on at Lindley." X Block is the original Syrah vineyard at Bien Nacido. This dark, bold Syrah had great character with deep savory flavors of earth and spice. Fined with organic egg whites and bottled without filtration, the end result is a pure reflection of what happens in the vineyard. This beaufiul Syrah made with 100% whole cluster, presents with a bit of pyrazines (bell pepper) on the nose, then provides an intense peppery flavor and long finish. NOTE: Many of the above wines were sampled at the Drinking in the Differences Seminar held at Star Lane Winery in Happy Canyon and conducted by MS David Glancy of San Francisco Wine School. 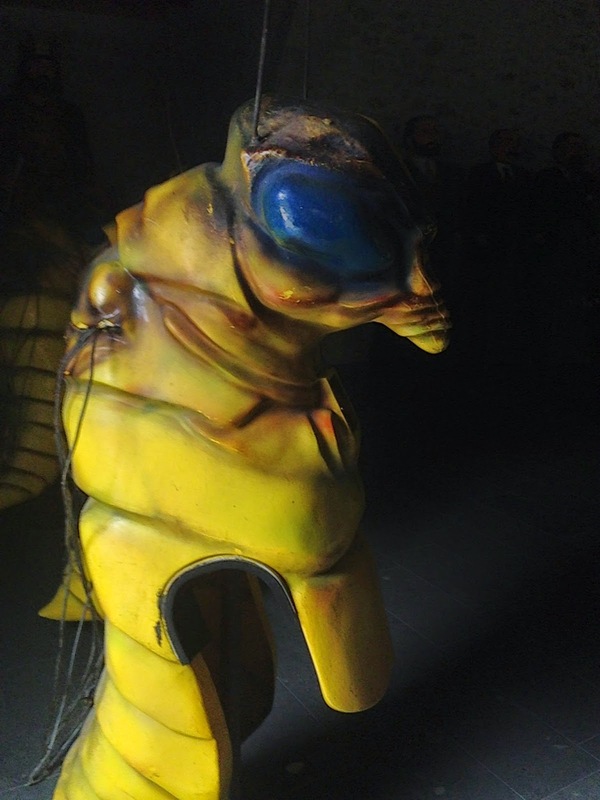 Stay tuned for a new post about that excellent event coming up. No! I’m not mad, I really had a great time at #WBC14. I’m merely making a play on the movie title Diary of a Mad Housewife, which was made before the majority of your were born, so nevermind. NOTE: For those of you with ADHD there is a short video condensing this #WBC14 Recap into a 3 minute slideshow at the bottom of the page. But read on. Reading is good for you. I was met at the Oakland Airport by @dallaswinechick aka Melanie Ofenloch and Liza Swift of @Brixchix_Liza, who picked me up in the BrixChix luxury SUV. After many hours on the road, we arrived in Los Olivios, at Tercero wines. There is nothing like a glass of chilled wine after a long drive in a hot back seat, and Tercero Granche Blanc was just the ticket to wipe away the miles. I’d never met Larry Schaffer of Tercero before and I hedge to say, he may wish he never met me. But actually we had a blast. From Tercero we went out to Beckman Winery along with Frank Morgan @DrinkWhatYouLike, who was kidnapped off the streets of Los Olivios. We tasted the Beckman wines and then went into the barrel room with Mikael Sigouin to taste samples from his own label, Kaena. I’ve never had so many barrel samples in one visit before. Many tasted ready to bottle. All were sampled from individual syringes which were used to prevent cross contamination and also looked way cool. Next we checked in to the Windmill Seen Better Days Inn. Is there a Trip Advisor rating for skeevy? Although in fairness I must say the electrical supply at the Windmill was a far superior to that of the Buellton Marriott where it took 18 hours to get a full charge on an iPhone. Were they having a brownout at the Marriott, or what? Quick change of clothes and off to the The Hitching Post II for dinner. It’s a mandatory stop on the “Sideways" tour. The atmosphere was cross between a wine geek pilgrimage spot and a lounge lizard pick up joint, with clientele to match. Ask Frank Morgan about the table next to us. Whoo Boy! Back at the Windmill (Seen Better Days Inn) the parking lot was in full Sideways mode with a bunch of drunk guys that took notice when we piled out of a car emblazoned with Brix Chicks on the side. Uh, oh. I retired to my luxury suite for the night while the rest of the #RougeTrip group went in search of gentle massages. Don't ask. 9AM-- Bus to Star Lane winery in Happy Canyon for -- Santa Barbara “Drinking in the Differences” seminar-- led by MS David Glancy and Fred Swan of San Francisco Wine School. This was by far the best part of my trip to Santa Barbara in terms of learning and gaining a comprehensive overview of the region. We were able to taste many wines and get the winemakers perspective on each. Excellent presentation. Thank you David and Fred, and Star Lane for hosting. 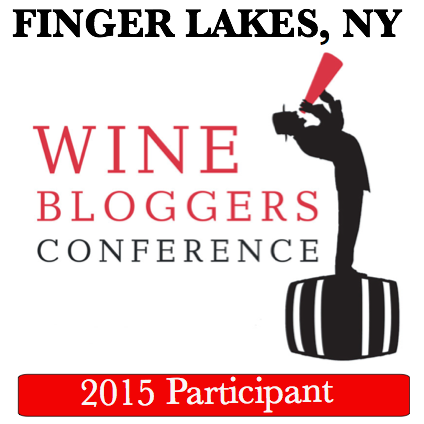 I have in more in-depth post about the “Drinking in the Differences” seminar coming up. 5PM-- Check-in at the Marriott and catch the bus to the Rodney Strong 25th Anniversary party. If only I’d known about Rent The Runway or owned a few tiaras like Thea Dwelle @Luscious_Lushes I would have been more appropriately attired in the de rigur silver. Robert Larsen and Rachel Voorhees hosted a terrific party. Naturally the wine from Rodney Strong and Davis Bynum paired very well with the incredible food at Solvang’s Root 246. It was certainly the best restaurant dinner of the entire trip. 11:00 PM --Walked to Standing Sun Winery After-Party to keep my carbon footprint small. Actually I missed the bus. But it was so close. I also missed meeting @SSunChristine who I’d been chatting with on twitter. She gave so many great tips on where to eat, but hope to meet her the next time I'm in the area. TIME? ?-- Back at the Marriott I found my way to the Solena Estate and #BCwine suite with April Yap- Hennig @SacredDrop, and Sujinder Juneja @sujinderbc and Leeann Froese @lfroese from @TownHallBrands. I was glad to see some #BCwines on hand as I have become a bit of a #BCWine groupie. In addition to the Oregon Pinot from Solena -- Townhall poured Mt. Boucherie Family Reserve Gamay Noir 2012, Haywire Switchback Pinot Gris 2012, SpierHead Pinot Noir 2012, Serendipity Viognier 2012, and TIME Meritage 2011. Skipped the hotel food and went directly to Industrial Eats a few blocks away. This place was incredible. Thank you @SSunChristine for the recommendation. Opening Keynote -- Much has been said on this, but the underlying message struck me as elitist. Do What You Love, Love What You Do. Tell that to the person who cleaned your room. Are they doing what they love? Probably not. Not everyone has the means to go on sabbatical and see a haiku in the sand at sunset on a beach in Belize and come up with a plan to save the worker bees from mediocrity. Kumbya, and pass the wine. Speed Tasting Whites-- I have mixed feelings about speed tastings, but as much as I vacillate on whether the format is a good thing or a bad thing, I always seem to find a new-to-me wine that is a standout. This year that wine was the Grassinni Saugvion Blanc from Happy Canyon. Good god, that was delicious. Excursion-- I was a very lucky winelover to get on the right bus. ProTip: If you ever see Fred Swan standing in line, don’t question, just get in line behind him and let the experience unfold. And unfold it did at the stunning Presqu'ile Winery. This was by far one of the best excursions I’ve ever experienced and I’ve attended 5 wine blogger conferences now including Sonoma, Walla Walla, Portland, and Penticton. (Although Portland, with the “fake bus arrest by Officer GoodBody" on the way to Carlton, was one for the ages.) Our bus also had James Ontiveros on board to fill us in on some aspects of the vineyards we passed on the way to Presqu’ile. Austrian Wine Heuriger -- Going rogue Austrian style. Loved the chance to try so many Austrian wines in one spot, and the food was authentic and plentiful. Including a pretzel so large it could have served as a personal flotation device for five people. The Heuriger was great fun and gave me the chance to dust off some high school German. Du siehest lustig in iheren Sonnenbrillen and Ya, diese wien ist sehr gut! Jordan and J always have the best parties with the best hosts -- Miss Lisa Mattson @lisamattsonwine and Miss Taylor Eason @TaylorEason. Back to Industrial Eats where the word had spread this was the place. I felt bad for the regular customers besieged by a room full of noisy bloggers, but I’m sure the owners appreciated increased business. My favorite official sanctioned session was the Ballard Canyon Grower Producer Wineries – Syrah Territory. I'd like to see more regional tasting seminars like this at WBC. Patrick Comiskey's opening remarks on Ballard Canyon Syrah was like Ginsberg reading Howl. Transcendent! Skipped the Wine Blog Awards and partied with Craig Camp and his Cornerstone Cellars wines. 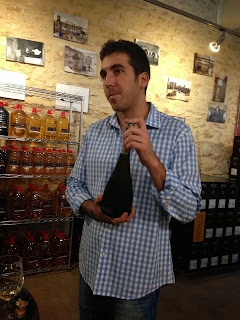 Authentic Press Party -- Shawn Burgert @AwanderingWino hosted a dynamite after party at Saarloos & Sons Winery. Great night of mix and mingle with winemakers and fellow writers/bloggers. Amazing selection of woodfired pizzas made with some eclectic ingredients. Favorite moments of the evening: 1) Seeing Melanie and Liza immediately pull out their credit cards and join the Saarloos wine club on the spot, after Keith of Saarloos & Sons poured his wines. 2) Hanging out on the patio with Michele Francisco @winerabble and catching up. After-After Hours: A crazy round of Cards Against Humanity in room 255 was shut down by hotel security after some poor soul in the next room was expecting to sleep. But before we got kicked out I witnessed Michael Wangbickler @mwangbickler, break out in a fit of laughter that was 95 points of hilarity. Why am I up at 9 am? 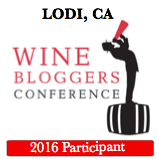 Oh right, because I said I’d go the Wine Writer Workshop, and so glad I did because it gave me plenty to write about here. I stumbled out of the Wine Writer Workshop and was whisked away to Los Olivios for lunch with Refugio Ranch at their private estate house, but not before I got myself to the Alta Maria tasting room to buy some of the Chardonnay and Pinot I’d tasted the previous night at Presqu'ile. The Alta Maria wines are seriously beautiful wines, captivating and impossible to ignore. The Refugio Ranch tasting/drinking was lovely and relaxed. The vineyards are not planted in contiguous blocks so it’s very restful to gaze out at the vines dotting the landscape. 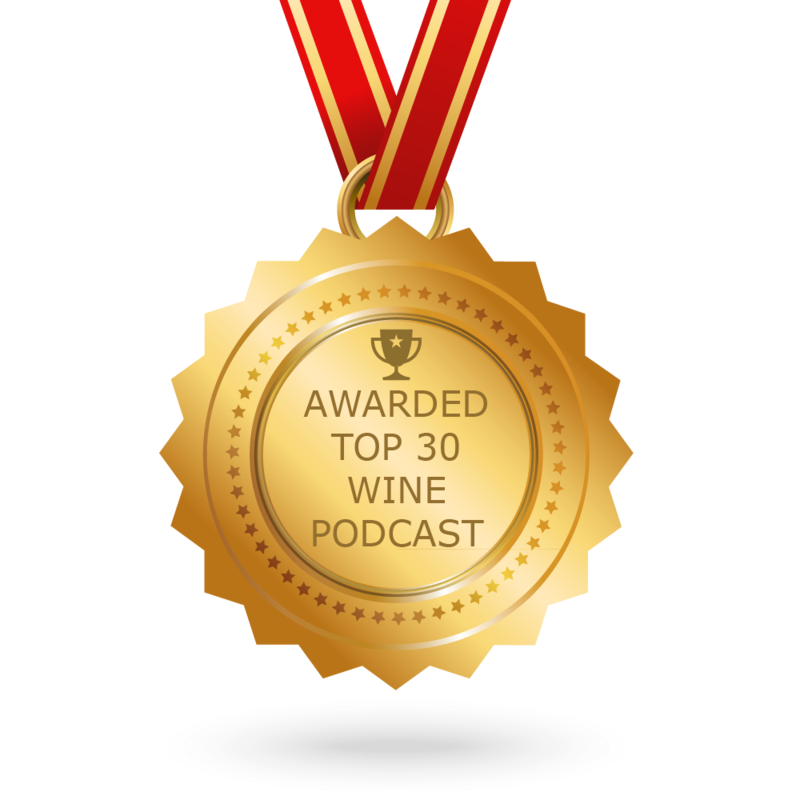 Great time chatting with our host Jeff Butler and thanks to @Dallaswinechick for arranging it. Clos Pepe Party -- Off the list (non-sanctioned) and off the hook—There was craft beer from OCD Brewing, speakeasy cocktails, fried quail, and pizzas made by Wes Hagen himself, along with miles of wine bagged and foiled to taste blind. Local food, wine, beer, music, and people are what make a party great. I get Wes. I can relate to his rebellious nature. He speaks his mind and he has a lot to say. I got kicked out of Catholic school for the doing much the same thing. But most of all I appreciate Wes’s basic philosophy--You don't have to talk about wine, you don't even have to drink it. But just once every day come together with the people you love at table. He makes it sound sacred -- "at table" -- dropping the article instead saying at ‘the’ table. But he has a good point—join together with people. Look them in the eye, drop your devices and connect your holy spirit in conversation at table. That's what it's about. During the party a large group of bloggers sat together, but instead of joining them I went in search of a table with people I did not know. I sat with a young woman and asked if she was a winemaker. “Oh no!" she laughed. "I’m with the band.” She was the sister of the one of the band members and we talked about how music and wine could be described similarly. I commented that the band had a great sound-- Grounded with an old world sensibility and played in a new world style with great vigor and verve. I think she wrote it down, or dismissed me as a kook. 50/50 chance either way. Later I met a lima bean farmer named Mud and we had a spirited conversation about farming and the lay of the land. "I'm just a farmer not a winemaker," he said. Nothing fancy--Dirt. Water. Beans. So I asked him his opinion on the naked wine movement and he replied "Yeah! Lets get naked and drink in the pool!" I guess my question was misinterpreted, or mis-heard as an invitation to go skinny dipping, but it gives a new spin to the concept of naked wines for sure. I also met and spoke with Joanne Duray, winemaker and owner of small +tall wines, and she told me had just released her first vintage. Ironically, I’d tasted one of her Pinot's in the blind bags, but did not know until later the when the bottles were unwrapped and I saw the number correlated to my notes. It was one of my favorites. Synchronicity be that. Thanks to Wes for the philosophy and the hospitality, and to all the winemakers that brought their wine to share at table. I wish I could stay on a few days more to revisit the places I loved and check out the ones I missed--but in the words of our former Govenator...I’ll be back. Big thanks to Morgen McLaughlin, Executive Director of the Santa Barbara Vintners Association for all her work pulling together the excursions and bringing Santa Barbara County wines to the forefront of our minds and palates.